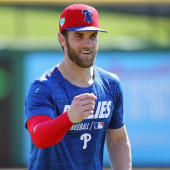 You know the refrain by now: spring training is underway, but thanks to a sloth-like free agent market names like Bryce Harper, Manny Machado, Craig Kimbrel, Marwin Gonzalez, and Dallas Keuchel remain unsigned. This is typically the time when we begin transitioned from hot stove concerns to pondering things like division races and playoff contenders. However, the winter of 2018-19 -- just as was the case with the winter of 2017-18 -- demands that we divide our attentions between prognostications at the team level and a free agent market that's still stuffed with talent. So that's what we're here to do. Below you'll find the updated division-by-division projections from the SportsLine Projection Model (@SportsLine on Twitter). These are updated to reflect all signings and trades to date, but with the likes of Harper and Machado still looking for work the numbers you're about to see don't amount to the final word. So let's have a look at how SportsLine presently sees the various and sundry playoff races stacking up, but let's do so with one eye on which teams need additional help -- help that is, you know, still widely available on the free agent market. In case you're not familiar, the SportsLine Projection Model simulates the season thousands of times and arrives at an average win total for each team along with each team's chances of winning the division and making the playoffs by any means (i.e., winning the division or claiming one of the two wild cards in each league). Let's start with the projected division-by-division standings in the American League. As you can see the margins are tight at the top, as you would expect. Right now, SportsLine leans Yankees by a narrow margin. The margin is such that, yes, the Yankees should absolutely be in on Machado. The infield situation is crowded and will become more crowded once Didi Gregorius returns from Tommy John surgery, possibly in June. However, with a 26-year-old superstar like Machado you figure things out. As you can see, the Yankees are all but locks for the postseason, but there's a great deal of worth in avoiding that knockout Wild Card Game. The only way to do that is to fend off the defending-champion Red Sox and win the AL East for the first time since 2012. Elsewhere, the Rays have legitimate designs on the postseason, but they continue to run a payroll that's so low as to border on malfeasance. Given the market, they have the chance to invest in the product to a meaningful extent, should they choose to do so. The champion Red Sox, meantime, badly need some bullpen help. The Indians have had an uninspiring offseason and then some (the Carlos Santana reunion is probably their most notable winter addition), but playing in baseball's worst division means they're not really being penalized for it. The Indians are heavy favorites in the AL Central, but right now they're poised to enter the season with a likely starting outfield of Leonys Martin, Tyler Naquin, and Greg Allen. The Indians obviously aren't going to pay the going rates for Harper, but they absolutely should be willing to do so. Adding -- to repeat -- a 26-year-old superstar would address a glaring need and give the Indians a much stronger position moving forward. Their window is gradually closing, and they should be all-in on trying to win their first World Series title since 1948. As for the Twins, they have a shot at being in the wild-card mix in the AL. While Jorge Polanco isn't a liability at shortstop, Machado would be a substantial upgrade that significantly improves their postseason chances. The White Sox probably aren't contenders even if their pursuit of both Harper and Machado bears fruit, but the fact that each is, to repeat, 26 years of age means they fit near-, mid-, and long-term planning. As you can see, the A's are expected to take a big step back from their 97 wins a season ago (a defensible stance) while still remaining in the wild-card race. They're expected to be in tight fight with the Rays for the second wild-card berth, and it's obviously not too late to improve their standing. At the top the Astros aren't a fit for Machado, and they're not in on Harper. You can squint and see potential problems for them at the outfield corners (Michael Brantley and Josh Reddick will be the primaries), but there's no real path to Harper. Given that they've lost Charlie Morton to free agency and Lance McCullers Jr. to Tommy John surgery, a reunion with Keuchel makes some sense. Thanks to some young arms, however, Houston isn't desperate on that front. Out in Orange County, the story with the Angels is their ongoing waste of Mike Trout's singular peak. Machado would be a huge upgrade over Zack Cozart at third (assuming Machado would be willing to forego his designs on a shortstop job), but the Angels don't appear to be in the mix for him. That level of upgrade would move the needle for the Angels and put them squarely in the wild-card mix. Keuchel also makes sense for a Halo rotation that's alarmingly thin. Yep, the system is quite bullish on the post-Harper Nationals. With an outfield of Juan Soto, Adam Eaton, and Rookie of the Year candidate Victor Robles, they should indeed be fine without him. As well, GM Mike Rizzo has been among the most active of operators this offseason, as he's added to the fold Patrick Corbin, Yan Gomes, Brian Dozier, Anibal Sanchez, Kurt Suzuki, and Kyle Barraclough, among others. The Braves won the flag last season, but SportsLine projects a step back in 2019. Rotation depth is a potential need, so Keuchel and maybe even a side bet on Clay Buchholz should probably be considered. The bullpen is also a potential concern, and a reunion with Kimbrel would address that -- provided there's an understanding that peak Kimbrel probably isn't coming back. The Mets remade their roster in a big way under first-year GM Brodie Van Wagenen, and right now SportsLine expects them to add six to seven wins to their 2018 tally. They're very much in the mix for a playoff berth. The Phillies of course have widely been expected to be major players this offseason, and they already have been: Andrew McCutchen, Jean Segura, J.T. Realmuto, and David Robertson have all been added. SportsLine, though, is still bearish on the Phils, so it's good for their interests that they're still heavily in on Machado and Harper. GM Matt Klentak badly needs to land one of them. So here's a compelling pile at the top. SportsLine expects a fairly heated race for the NL Central title among the Cubs, Brewers, and Cardinals. Enabling such compression is that the Cubs -- in win-now position and overflowing with revenues -- have in essence taken the winter off. By all accounts they have a strict budget that won't permit a pursuit of Harper or Machado (they could use either). That's a dereliction of duty on the part of the Ricketts family, and it should be identified as such. Their lack of commitment means the flag is in play for the Brewers and Cardinals, who of course dealt for Paul Goldschmidt in early December. The Dodgers remain a favorite of SportsLine's, and right now they forecast as the NL's lone 100-win team. The Rockies and Diamondbacks look like fringe wild-card contenders, but neither is going to be in the mix for big-name free agents. The Giants are heavily in the Harper derby and may in fact be the favorites. No, a Harper inking is not likely to yield a playoff berth in San Fran, but it's an eminently defensible move for a number of reasons. As for the other, uglier end of the continuum, the Orioles are projected to claim the No. 1 overall draft pick for a second straight year. In case you're unaware, you can follow the updated SportsLine team projections on our MLB standings page.